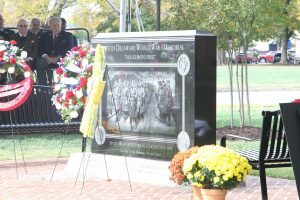 DOVER – The Delaware General Assembly, the Delaware Commission of Veterans Affairs and the Delaware Heritage Commission unveiled a new monument in honor of those Delawareans who served their state and the nation in World War I. 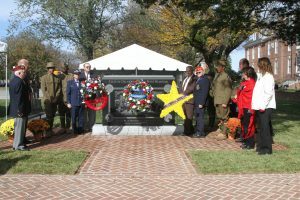 The monument is installed on the grounds of Legislative Hall and was dedicated during a special ceremony on Saturday, Nov. 4. The granite memorial features reproductions of two famous works of wartime art by Delaware illustrators. One side depicts a 1919 piece by Frank Schoonover, dedicated to the Delaware “Doughboys” who fought with the Allies in France. The obverse depicts a 1918 war bond poster by Ethel Pennewill Brown Leach, in honor of the sacrifices of those who supported the war on the home front. ns of World War I remain, many of their descendants have kept alive the memory of their service, including Sen. David McBride, president pro tempore of the Delaware Senate. This year marks the 100th anniversary of the American intervention in World War I. Throughout the United States’ engagement in the war, some 9,000 Delawareans served overseas in the U.S. Army, Navy and Marine Corps. Of that number, 43 Delawareans were killed in action and 188 were wounded. Many more succumbed to the great influenza epidemic of 1918-1919, bringing the total number of Delaware service personnel lost during the war to 270. 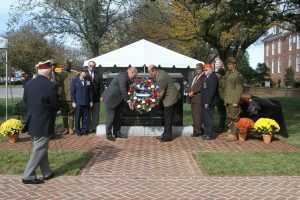 The installation of the monument was made possible by the Delaware General Assembly, with support from the Commission of Veterans’ Affairs, a division of the Department of State.